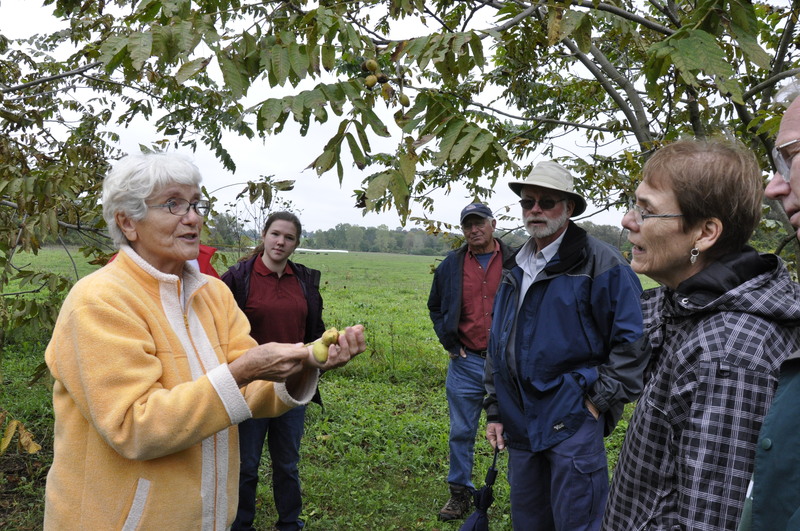 On October 1st, members of the Huron Perth Woodlot Association were led on a tour of the Trick family farm, near Clinton. 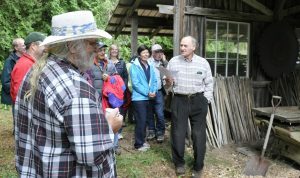 With about 85 members in attendance and lots of things to see, the tour group was split into two – with one group heading out on wagons on a woodland tour, while the other learned about the history of the grist mill and sawmill operation. The property has been in the Trick family for more than 140 years. After decades of planting trees, there are several woodlots on the property in different ages of maturity and species mixes. 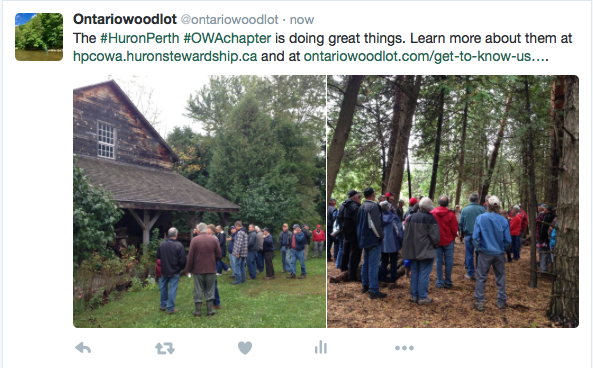 We viewed a pine plantation, mature maple woodlot, and a stand of walnut grown from planting seeds. Tom Trick can remember when sand dunes used to build up in the areas that were once used for cropping, and are now in trees (pine and walnut). The group even saw areas where the invasive glossy buckthorn was being shaded out by the mature maples. 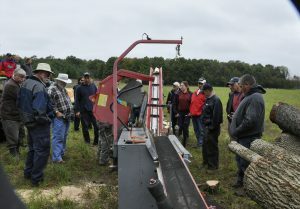 Demonstration of a firewood processor. We viewed a double row windbreak planted in 2015 by the Ausable Bayfield Conservation Authority along several of their fields. The tour group also visited a woodlot that had been predominantly ash. Much of the ash was harvested last year. Acorns were hand planted in the open areas, and the little red oak seedlings are starting to pop up. 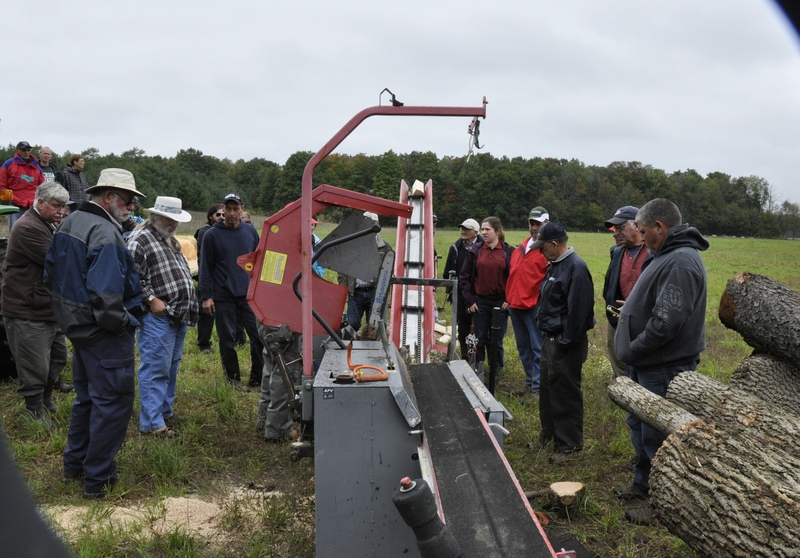 Tom also gave a demonstration of a firewood processor. 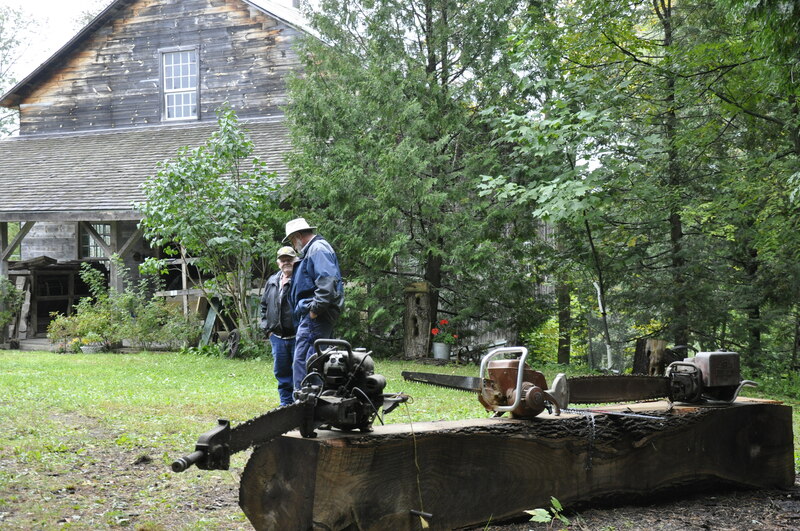 Bill Trick tours the sawmill. 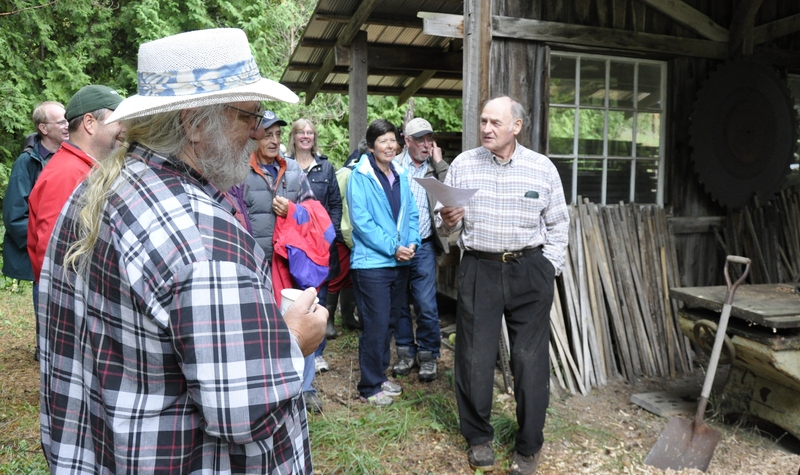 Bill Trick talked about the history of the mill and its importance in the County. The roadway between Clinton and Bayfield formerly crossed over the dam by the mill, since there was no reliable crossing through the Trick’s creek bog until 1880. Bill’s grandmother told him that during the 1930’s she fed many hungry transients who then bedded down in the barn. For a number of years it was common for an itinerant barber to set up his chair on the platform of the Mill for a week or so in the spring and in the fall and cut the hair of the farmers, while boarding with the Tricks. Several times, men who were cutting ice off the pond for storage at ice houses, fell into the pond by misstep, and then hustled up to the Trick’s kitchen to strip and warm up. The mill was a major hub of industry in the mid-1800s. At that time, Rock Elm was being sold for $5/1000 bd/ft, and labour costs were $1.50 per day. Some Huron County residents might recognize the names of their relatives from the old mill records. The mill was built with sawn floor joists, some sawn framing pieces, and double layers of wide floor boards. There are two water turbines installed in the mill. One operates the electrical generator that provides power for the property, and the other powers a saw used to manufacture cedar shingles. 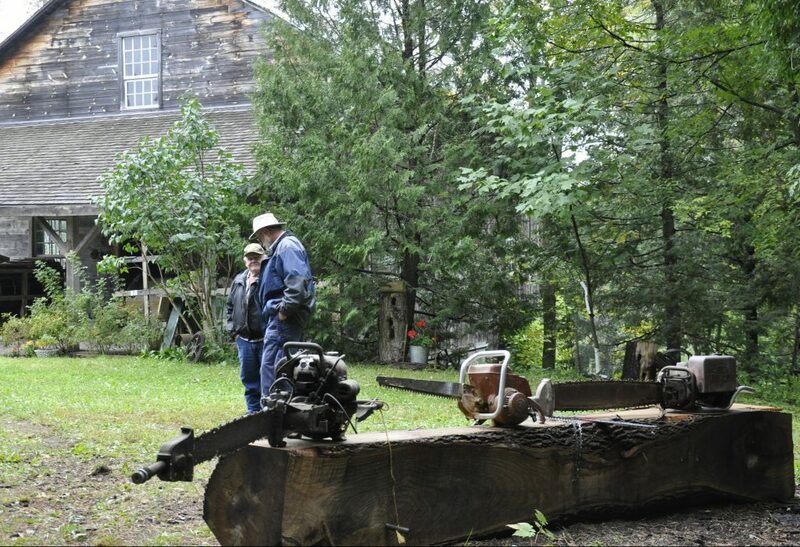 There were many pieces of equipment from throughout the history of the property including a collection of chain saws, a ‘sticker machine’ from the Clinton Piano Factory, an antique circular saw, and a modern band saw mill. Thea Trick shows the group heartnuts from a tree she grew from seed. 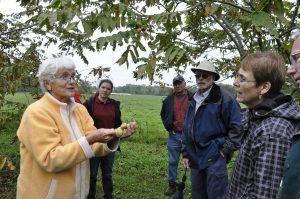 Thea Trick has a talent for growing trees from seeds, and has several interesting species in her orchard including paw-paw, heartnut trees, and Osage orange. Thank you to Bill, Thea, Tom, Cherilyn, Anna, Alex, and Charlie Trick for being such gracious hosts. Photos were provided by Brent Bowyer. This property and mill have been owned by the Trick Family since 1873, and was purchased by Thomas and Catherine Trick. Thomas was the great great grandfather of Tom Trick. 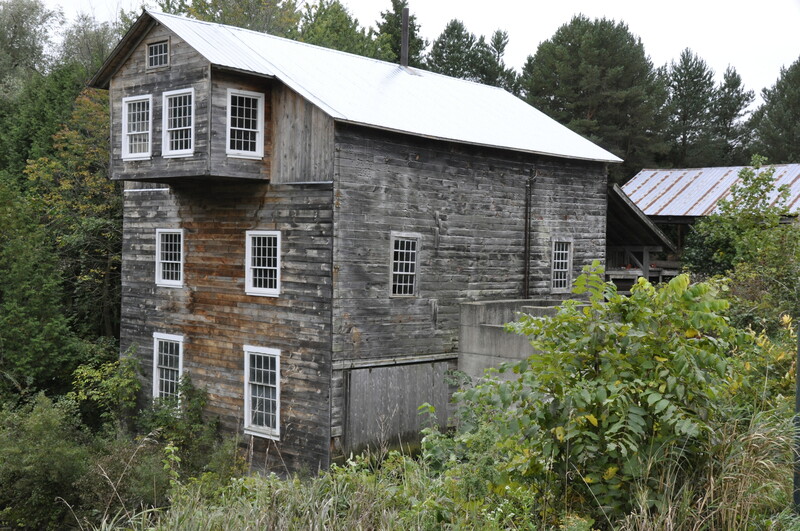 Records show that this grist mill was built about 1850. However there were two water powered sawmills installed on the other side of the stream, the first being an up and down or muley mill, which was replaced by a circular mill prior to 1880. The residuals of that preconfederation muley mill was collected in later years by staff of the Ford museum. The circular mill was dismantled in the 1915 period, due to foundation problems with the intentions to rebuild it but this unfortunately did not happen. The present circular mill was installed primarily for the family’s own use about 1980. Tom now owns and uses a band mill, and the present circular mill will probably be dismantled in the near future. Since this tour is timber related, I have reviewed some of the old records that we have on the mill operations. We have records from mid-1800’s but the two in the desk at the entrance door are the “Saw Mill Book” and the “Chopping Book” which lists the activities and accounts from the late 1880’s to early part of the 1900’s, for the two mills. The “Saw Mill Book” shows the following in 1890 to 1910. 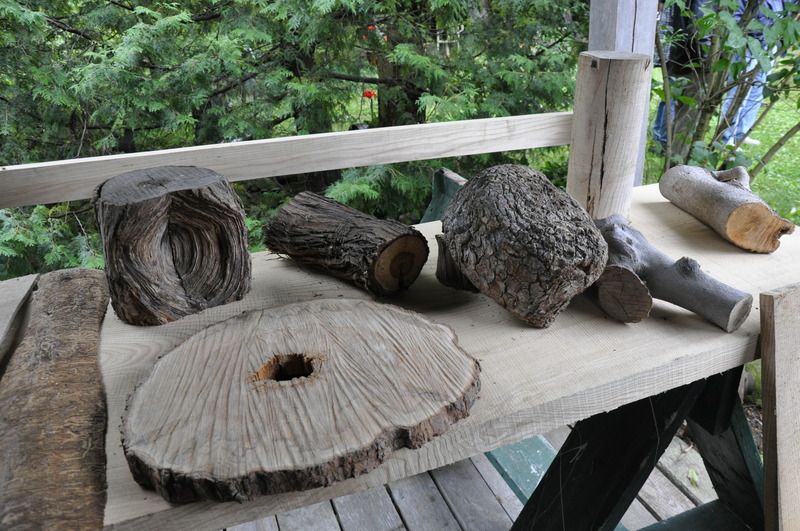 Hard maple, hemlock and cedar were often tolled against sawing.